The topic of caring is a popular theme in the feminist literature, particularly the literature on women in the caring professions or disciplines, e.g., teaching, nursing, social work, child and youth care. What is apparent from this literature is that "caring" from the feminist perspective is somehow different, having something to do with being a woman, and in some way embedded in a different value structure of feminism. I use the words somehow, something, and some way, because it is not altogether clear from the literature what the difference is between humanistic, Christian, or other caring views and caring from a feminist perspective. Caring involves both love and labour, and it is precisely this combination that underlines its conceptual complexity (Finch & Groves, 1983). Caring is human service work—"people work"—but it has not been recognized as work (Pascall, 1986). Caregiving is an activity encompassing both instrumental and affective relations (Abel & Nelson, 1990). Caring is a species activity that includes everything that we do to maintain, continue, and repair our world so that we can live in it as well as possible ... Caring can be seen as a process of four intertwining phases: caring about, taking care of, caregiving, and care-receiving (Fisher & Tronto, 1990). Before addressing this topic, it is important to first understand the historical emergence of maternal feminism since maternal feminism helps to explain the presence of caring rhetoric (such as the definitions cited above) in the caring professions. In the last two decades, maternal feminism has been identified as the underlying ideology that triggered the movement of women into public employment. Wanting to make a useful contribution, women transferred the values and caring functions they learned and practised within the home and the community to their newly discovered fields of work (Baines, Evans, & Neysmith, 1991). The presence of values and caring from maternal feminism were slow to emerge in the literature. This is evident from the earlier feminist literature which focused on issues of liberation: the oppressed majority, psychological and sexual repression, emerging political ideologies, and consciousness-raising efforts. In essence, there was an absence of caring rhetoric in the feminist literature and no scientific inquiry about the concept of caring until the 1980s. Despite that the caring professions and feminists are only beginning to define and research caring, and compounded by the low value placed on the caring professions (Baines et al., 1991) thereby inhibiting research funding, the paucity and lack of sophistication in research and writing on caring in the caring professions is still noticeable and emerging! It is the intention of this article to propose some rudimentary thinking about a feminist perspective on caring in child and youth care in order to prompt others to explore the topic. It is hoped that this will encourage further investigation into the concept of caring since it is the foundation for our field of practice. A first step in my thinking about the topic was to find out what people in the field considered caring to be and whether their views about caring conveyed a "feminist" perspective. A recent survey of experienced child and youth care workers on the subject of caring confirms that there is a lack of unanimity in defining caring, and that there is a vagueness about understanding the application of caring in the practice of child and youth care. The most common responses are presented in Table 1. The content analysis of their responses revealed two themes: (1) caring is about meeting a client’s needs or changing the client, and (2) being concerned about or being in relationship with the client. However, it is noteworthy that less than half of the sample gave similar responses which demonstrates that there is little agreement on what constitutes caring. Further, when respondents were asked to give examples of Caring they opted to describe activities: listening, hearing, counselling, spending time with clients, and providing support (see Table 2). In other words, when it came to providing evidence of caring it took the form of action and intervention such as teaching kids conflict-resolution skills or life skills, praising a handicapped child for dressing, or walking a child through pre-operative procedures in hospital. Interestingly, their examples did not depict those themes that were evident from their definitions: kinds of needs to be met, or expressions of concern, or the nature of the caring relationship. Initially, I was surprised and disappointed that child and youth care workers were not clearer, and in agreement, in their thinking about caring and how it would be manifest in practice. However, when reconsidering their definitions and their examples, a meta-analysis of the conditions/factors present in their definitions and from their examples of caring suggested that there is more agreement than I originally thought. Obviously, the respondents viewed caring as something that happens in relation to other. Further, their definitions and examples pointed to three factors present within the relationship: needs, affect or feelings, and action. Reflection on their responses suggested a model or framework for a way to think about caring relationships within caring professions. Figure 1 depicts a model or framework for Caring Relationships Within Caring Professions. The caring relationship between the care-giver and care-receiver is different from the generic-caring relationship encountered in our daily lives. What distinguishes the caring relationship in a caring profession from other caring relationships is the presence of three critical factors: (1) the condition of need, (2) an attitude of concern, and (3) intentional involvement in intervention. What distinguishes it further is that all factors are present for the care-giver and receiver and are interactive. It is the interactive nature of the three factors which accounts for the development and enhancement of the caring relationship within caring professions. The dynamic of interaction is complex in that it involves the interaction of the three factors for each individual as well as between the individuals involved (the worker and the client(s)). It is the presence of this dynamic and the interactive work (between worker and clients) within the dynamic that serves and enhances the caring relationship. Before discussing the three factors and how they interact to create the caring relationship, it is important to point out the advantage of having a model which identifies key factors which account for the presence of caring. The identification of key factors allows for translations and differentiation across situations. In other words, while the key factors are identified, e.g., need(s), attitude of concern, and intentional interventions(s), the factors must be differentially defined or described for each situation at a particular point in time. The model permits then, indeed requires, the identification of different relationships appropriate to and congruent with the demands of the particular circumstances of the care-giver and care-receiver. The advantage in this kind of model is that its application allows for different views based on different values which are related to culture, beliefs, theoretical orientations, etc., about what is happening. While the key factors mandate the conditions required to endure the presence of the caring relationship, they do not prescribe how the relationship must look, appear, or how the relationship must proceed to be caring; this is left to the discretion, creation and experience of the care-giver(s) and care-receiver(s). The condition of need recognizes that the caring relationship attends to the personal needs of the child/youth family and to the professional needs of the professional worker. The condition of need defines the focus of care which in the case of the child/youth/family is a condition of being unwell, unsafe, at risk, or in need. To attend to the need is to address whatever is missing in order for the particular child/youth/family to be in a state of well-being. For the worker, the focus of care is to engage the child/youth/family in the caring relationship aimed at promoting the recreation of the child/youth/ family’s well-being. While the focus of care, as defined by the needs for the two partners is different, the critical aspect for both partners is the recognition and acknowledgement of their need(s) and their mutual engagement in addressing their need(s). The model requires only that the focus of care be the need(s). It allows that different theoretical orientations, values, and beliefs about needs may be used, and does not prescribe any single, and by implication, "right thinking" or "politically correct," orientation which must be applied. Examples of needs might include safety, self-image, behavioural skills, personal boundaries, family boundaries, new understanding, and so on. Needs of workers are often not considered or when considered, not valued in therapeutic relationships. The condition of need in this model recognizes the need(s) of workers as they emerge in the caring relationship. For example, I recently received a phone call from an ex-client requesting an emergency session while she was in town. My need to accommodate her need by being a responsible child and youth care worker, pressed me to make an early Saturday morning appointment which intruded on my otherwise peaceful weekend with my family. Another identifiable need which emerged in this case was my need to assist others when I think they are in an unsafe condition. My own beliefs about people being entitled to safety, and not having to put up with intimidation and abuse, is my need which must be addressed in this particular relationship. The condition of concern refers to the attitudes and feelings of the care-giver and care-receiver. For the child/youth/family the attitude is self-directed in that there is a feeling/caring about the self and one’s own need(s). Further, the child/youth/family have feeling(s) for the caring relationship which is related to and expressed to the care-giver. Likewise the care-giver has feeling(s) for the care-receiver and their relationship with each other. This presence of concern and feeling takes professional caring into the personal realm and requires that both parties show up, be present, be engaged at a feeling level for each other. The presence of feeling(s) provides the link which connects the worker and client. Very simply put, without this connection, without the feeling(s) in the relationship, the people do not matter to each other. It logically follows then, that if the people do not matter to each other, as evidenced by how they feel, the condition of need would not matter. 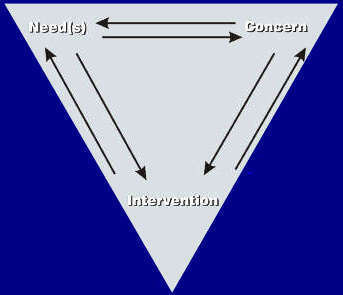 In turn, without concern for needs, interventions would be pointless. The intentional involvement in intervention requires that the worker bethoughtful and have clarity of purpose in determining "what to do before doing it." The worker does not randomly try out techniques in some mindless way hoping that something will work! The professional care giver uses knowledge and skills to deploy a specific intervention designed to address the child/youth/ family’s need(s). This professional involvement is about "doing with intention." The intentional involvement in intervention is what brings professionalism to the caring relationship. It presumes a body of knowledge, skills, and standards of practice recognized by workers and their professional colleagues. The child/youth/family must also be involved in the intervention. However, in the case of the client the involvement is about participation or being actively engaged in the intervention activities. The client’s intention has more to do with commitment to being engaged in the activity rather than planning and implementing the activity. Caring is an intentional intervening interaction initiated out of the care-giver’s and receiver’s perceptions that something/someone is unwell, unsafe, at risk, or in need; the interaction is embodied in shared/mutual attitudes and feeling of concern for each other. Does the model and this operational definition of the caring relationship connote a feminist perspective? Yes, and here’s why. Typically, the professions have placed emphasis on identifying the needs of the client, not the worker; required the worker to be intentional in intervention, but rarely viewed the client as participating in the intervention other than as receiver of it; and expected a professional concern which is clinical, sanitized, and bereft of feelings, other than those expressed by the client. The premise has been that, above all, professionals must be responsible, professional, and appropriate! In contrast, this model of caring for the caring professions views the context for caring as being the relationship between the care-giver and the care-receiver. It differs from the typical professional interaction in that the relationship is the foundation for caring. To be in relationship means to have a connection with and to contrast with the other. As well, when in relationship, there is an experience of feeling with regards to the connection and contrast with the other. Clearly, then, one of the dimensions of the model which makes it feminist in perspective is the attention on relationship; in essence, on being with the other in relation as partners, as opposed to one over the other. Declared feminist ideals have always included justice and equality in relationships (Fisher & Tronto, 1990). Another aspect of the model which connotes a feminist perspective is the nature of the concern factor. Because the dimensions of the model are interactive, concern is interactive and occurs between the care-giver and care-receiver. For concern to be interactive means that it would be expressed; therefore, concern refers to the actual expression of regard, affection and liking between the worker and client. From a therapeutic point of view, this expression of feeling between care-giver and receiver enhances the very nature of the relationship, and empowers both the client and the worker to be truly present and partners in the therapeutic relationship. When this concern is present and expressed within the caring relationship, it takes into account concern about the other two factors: need(s) identification and intentional intervention(s). In other words, when operating as partners within the caring relationship, needs identification and intentional intervention are shared and addressed. The notion of partnership in sharing and participating in need(s) identification/resolution, expressing attitudes of concern, and engaging mutually in intentional intervention(s) sounds like the idea of "being in communion" which is a long established value of feminist perspective (Bakan, 1966). This aspect of being in communion in professional relationships distinguishes it from other caring relationships. A final dimension of the model which clearly identifies it as feminist in perspective is that while the key factors of the model are abstractions, they must be concretely manifest between two or more persons (worker and clients) in the particular relationship. Noddings (1984) argues that moral and ethical thinking is grounded in caring and that many people who live moral lives do not approach moral problems in the traditional abstract and formal way (based on principles and reason). She posits that, on a daily basis, people, and women in particular, approach moral problems by placing themselves in concrete situations thereby taking personal responsibility for the choices they make. She goes on to argue that women define themselves in terms of caring and actually "work their way through moral problems from the position of one caring" (p.8). The point being made here is that moral thinking requires a process of concretization rather than one of abstraction. While traditionally the logical and rational approach to ethical problems, as well as other problems, arises more obviously from masculine experiences, this is not to say that the concrete and caring approach cannot be shared by men. On the other hand, an ethic built on caring is, as noted by Noddings, characteristically and essentially feminine. What makes this model of caring within caring professions feminist in perspective, is the interactive component of attitude of concern(s), need(s) identification, and intentional intervention(s). The interaction that occurs between persons places an equal value on the individual needs of all players and their contribution with regards to what problems to solve and how to solve them. The caring relationship is one of partnership and the interaction within the caring relationship enhances the concern and ultimately the therapeutic relationship itself. The caring relationship is grounded in values of equity and communion, and values the specific and concrete over the abstract and reasonable. Abel, E., & Nelson, M. (1990). Circles of care. Albany: State University of New York. Baines, C., Evans, P., & Neysmith, S. (1991). Women’s caring. Toronto: McClelland & Stewart. Finch, J., & Groves, D. (Eds.) (1983). A labour of love: Women, work and caring. London: Routledge and Kegan Paul. Fisher, B., & Tronto, J. (1990). Toward a feminist theory of caring. In F. Abel & M. Nelson (Eds. ), Circles of care (pp. 35—62). Albany: State University of New York. Groves, S. (1983). Family day care: Economic and work related factors affecting the persistence of providers. Working Paper 9, Centre for the Study, Education and Advancement of Women. Berkeley: University of California Press. Maier, H.W. (1987). Developmental group care of children and youth. New York: Haworth Press. Noddings, N. (1984). Caring: A feminist approach to ethics and moral education. Berkeley: University of California Press. Pascall, G. (1986). Social policy: A feminist analysis. New York: Travistock Publications. Peterson, R.W. (1981). The focus, content and progress of professionalism in the child-development youth-work practice: Reflections from the child-care worker’s perspective. Child Care Work in Focus, 8(2), 2—6.